It is with sad and heavy hearts that we say goodbye to a lady who touched our lives so deeply. Lorraine Jean Davison, of Clearwater BC, passed away peacefully on April 26th, 2018 at the Royal Inland Hospital in Kamloops BC. Her loved ones were by her side. Lorraine was born on September 10, 1940 to Gust and Mabel Scramstad in Sheho SK. She was the youngest of 7 children. She later moved to Clearwater BC and met the love of her life, Dave Davison. They were married on April 26, 1958 and shared a beautiful life together. Lorraine loved to volunteer her time and offer her support to anyone who needed it. She was an active member of the Lion’s club for many years, participating in all kinds of local events. Her husband, Dave, played in a local band (Trophy Mountain Boys) and she always ensured that she was at every dance he played at. However, most who knew Lorraine remember her as the friendly cashier at the local grocery store, SafetyMart, where she worked for more than 20 years. Lorraine lived a life full of memories. She had a very large and loving heart and warmly welcomed family and friends to have a share in her life. She loved her children, grandchildren and great grandchildren dearly, always eager to hear about what each one was up to and always happy to be involved in any way possible. She was a loyal friend and showed her commitment to those she cared about, reaching out to lend an ear, picking up the phone to keep in touch, or hopping in the car for a quick visit. Her door was always open, too. Lorraine loved to take road trips. She always said that her favourite vacation would be somewhere at a motel where she could relax and catch up on knitting. And she never passed up an opportunity to have coffee with a friend or loved one in a café. Many of us will always remember her delicious apple pies, grandma jam and canned peaches. Stories of music and dancing, wood stoves and large family dinners will never be forgotten. Lorraine was a cornerstone in all our lives. She was one of the strongest women we knew who loved each one of us unconditionally. She was a fine example of a supportive, loving wife, devoted mother and gentle caregiver, and she was the greatest grandma we could have ever hoped for. She will be remembered for her generosity and integrity, her glowing smile and warm embrace and for the many lives she touched during her lifetime. Even the hummingbirds will miss her. 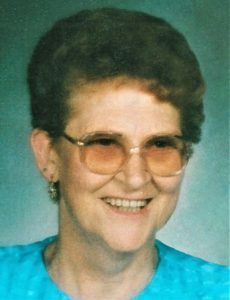 Lorraine is predeceased by her husband, Dave Davison, her father and mother, Gust and Mabel Scramstad, her brothers Allen, Melvin and Jerry and her sisters, May and Josie. She is survived by daughters, Donna and Debbie (Wade), her grandchildren Rikki (Luis), Brooke (Josh), Blair (Lorien) and Troilene (Tyler), 9 great grandchildren, sister Lilian Redman, and extended family Lorraine (Terry) and Whitney (Thommy), and many nieces and nephews, friends and relatives. A celebration of life for Lorraine will be held at 2:00 p.m. on July 14, 2018, at the Blackpool Hall, Blackpool, BC. I was so sad to hear of Lorraine’s passing, she was such a good friend to my Nan (Rene McMaster) and I loved seeing Lorraine when I was a kid coming up to Clearwater to visit. Her kindness and loving spirit was an instant connection for my young son when he met Lorraine and the two of them hit it off. Connor was so thrilled we camped in Lorraine’s yard when we cleaned out Nan’s old shed and he loved seeing so many hummingbirds whizzing about her yard. Lorraine always had a warm smile and kind word, it is truly a loss and words cannot express how sorry I am for her family’s loss. She is now up there dancing with her love Davey and Nan is tapping her toe to the music too.